During this year's Computex trade show, we've seen a number of 10GbE related products. Joining the LAN party was AKiTiO, who was showcasing their upcoming small form-factor Thunderbolt 3 to 10 GbE self-powered network adapter. The device will be available later this year, but its exact specs and price are currently unknown. 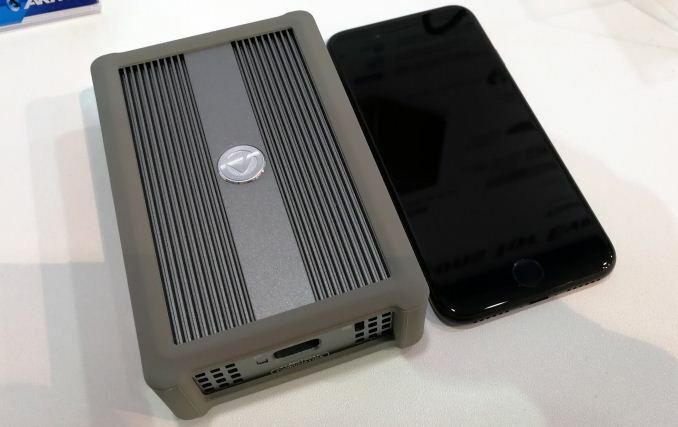 The AKiTiO Thunder3 10G (T3NA-T3LNITY) network adapter is a relatively small rugged box (see the comparison with an iPhone 7 below) made of aluminum with rubber pads on its sides for further protection. The device has one 10 GBase-T port, a Thunderbolt 3 header, as well as an opening for a lock. The Thunder3 10G network adapter supports five speeds, including 10GBase-T as well as NBase-T, and can work not only with corporate 10 GbE networks, but also with upcoming 2.5GBase-T and 5GBase-T networks primarily aimed at small businesses and consumers. 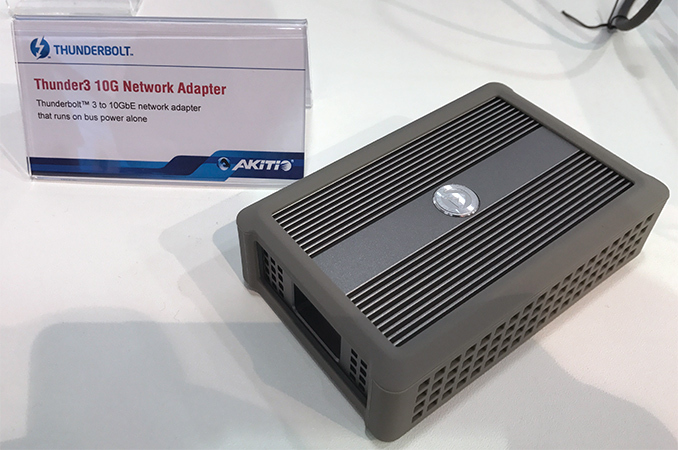 AKiTiO is not revealing which controllers drive the Thunder3 10G network adapter, but the architecture of the device is hardly very complex: there is a Thunderbolt 3 controller from Intel (since Intel is currently the only supplier of such ICs), a 10 GbE controller from an undisclosed vendor, a programmable microcontroller, power ICs, VRM and some other things (like LEDs). 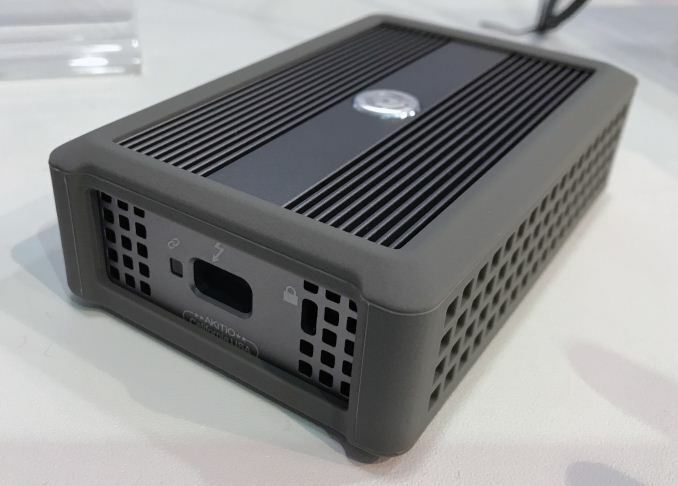 For their part, Aquantia demonstrated a reference design for a Thundebolt 3 to 10 GbE adapter at this year's show as well, but we do not know whether the AKiTiO Thunder3 10G uses an Aquantia chip and/or reference design, or is working with someone else. 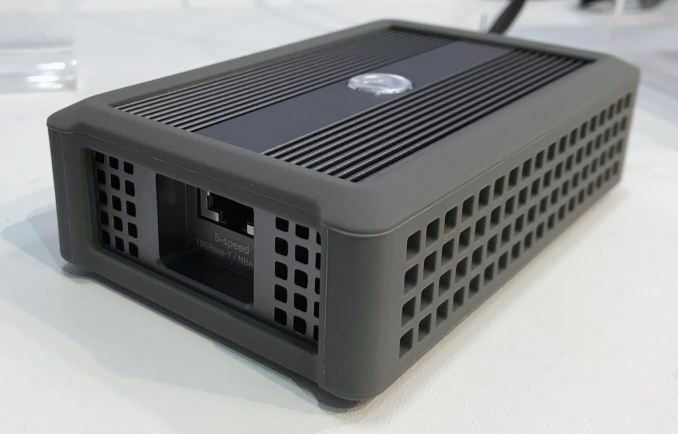 AKiTiO will be aiming their Thunder3 10G network adapter at those users who need to connect their laptops to corporate 10 GbE networks. And since modern thin notebooks do not have any on-board Ethernet ports at all, the device has the potential to become the most attractive of the TB3 Ethernet adapters. Another category of people who might be interested in the Thunder3 10G are those who plan to deploy a 2.5G/5G/10G network at home and have a PC that has a TB3 header, but only GbE support. In principle, it should be possible to plug the Thunder 10G network adapter at the end of a Thunderbolt 3 daisy chain after a display and a DAS, but that is something to be confirmed. AKiTiO says that the Thunder3 10G network adapter will hit stores later this year. As for the price, the company isn't confirming an official price at this time. However in poking around, what I'm hearing is that the device will cost hundreds of dollars once it hits the shelves, which admittedly is in-line with existing TB3 Ethernet adapter prices.